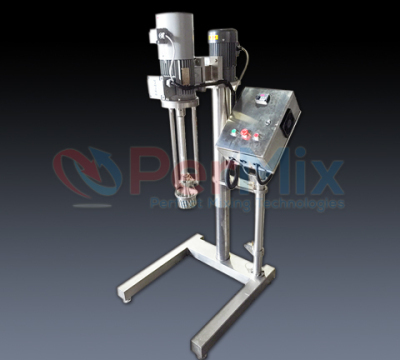 A jet mixer is used where homogenizing, dispersing, suspending, emulsifying, dissolving are required. Its advantages compared with a conventional agitator are free of aeration, no floating powder, no sedimentation, no additional baffles, no flow dead zones, and very high efficient that a small motor can keep large volumes in motion. A jet mixer functions with its special designed stator/rotor system. The rotor is usually a turbine impeller, and the stator is a curved guide tube surrounding the rotor. When it works, the rotor generates a strong axial flow from the surface of the liquid, going through the stator tube and towards the bottom. In this manner, floating powder is drawn into the liquid, and sedimentation is lifted up. With many circulations, the total tank can be mixed and homogenized without dead zones. 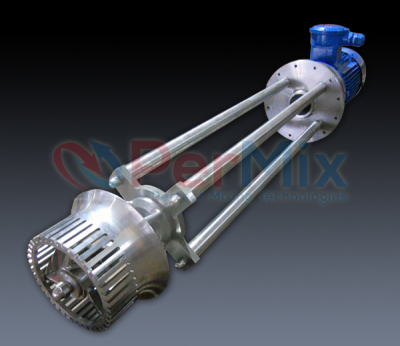 There are two types of jet mixer available, and the difference lies in the stator (as shown in left picture). The stator can be either with or without openings. A jet mixer with a stator without openings has a stronger axial flow, because all the materials will go through the tube from the top to the bottom. 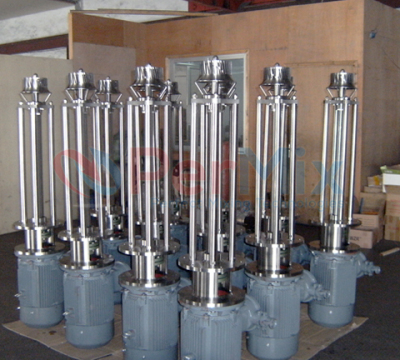 But for the jet mixer with a stator with openings, some of the materials will go out of the tube through the openings. This makes it have some homogenizing ability. 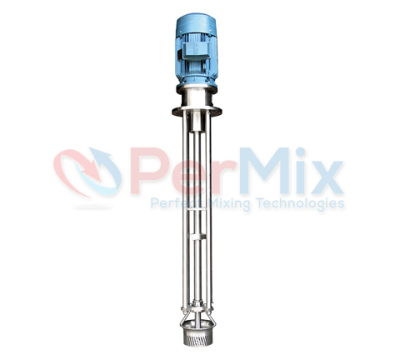 Jet mixers can be used in almost all branches of processing in the chemical industry, pharmaceutical productions, food industry and cosmetic products.